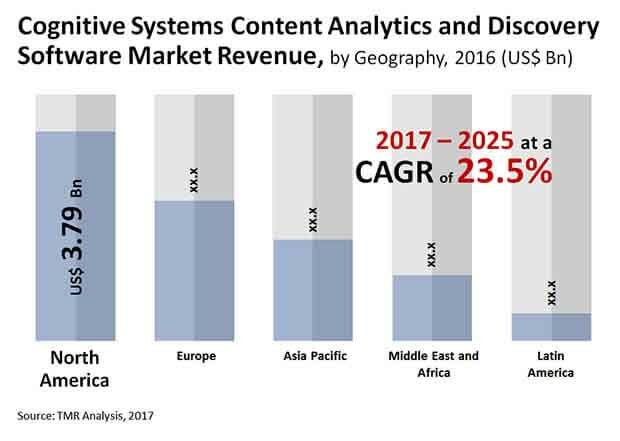 The global market for cognitive systems, content analytics and discovery software features a highly consolidated competitive landscape, wherein the top five companies cumulatively accounted for a massive 79% of the overall market in 2016, observes Transparency Market Research in a recent report. These, top vendors, namely IBM Corporation, SAP SE, Oracle Corporation, Google Inc., and Microsoft Corporation command stronghold on the global market owing to their immense focus on research and development and introduction of innovative products. An instance is the introduction of IBM Watson Imaging Clinical Review, a cognitive imaging solution, by IBM Corporation in March 2017. To reinforce their hold on the market, leading vendors are also keen on partnering and acquiring companies in the fields of cognitive systems, content analytics and discovery software. For instance, SAP SE announced its acquisition of Roambi, a leading cloud analytics company, in February 2016. Transparency Market Research estimates that the global cognitive systems, content analytics and discovery software market, which valued at US$9.88 bn in 2016, will exhibit an exponential CAGR of 23.5% over the period between 2017 and 2025, rising to a valuation of US$60.06 bn by 2025. In terms of application, the segment of natural language processing held the dominant share in the overall revenue earned by the global market in 2016. The vast rise in usage of smart devices is one of the key factors strengthening the growth prospects of the natural language processing segment. The segment of machine learning is likely to be one of the most attractive application segments for the global cognitive systems, content analytics and discovery software market during the forecast period. In terms of geography, North America dominated the global market in 2016. Early adoption of this technology and increasing volume of unstructured data are the key factors attributed to the stronghold of North America on the global cognitive systems, content analytics and discovery software market. One of the key trends significantly pushing up the global demand for cognitive systems, content analytics and discovery software is the rising usage of artificial intelligence across a rising areas of application. Significant advancements in data processing technologies and the mounting rise in large, diverse, and highly complicated data sets, and vast developments in the field of machine learning are leading to a vast rise in the window of opportunity for artificial intelligence, which, in turn, has emerged as one of the key driving forces of the global cognitive systems, content analytics and discovery software market. Furthermore, innovations in natural language processing are also bolstering the demand for cognitive systems, content analytics, and discovery software market. Voice-driven interface development platforms, social media analytics, and conversational computing using semantics learning are some of the most notable innovations in the field of natural language processing. The expanding set of application of these technologies is boosting the demand for cognitive systems, content analytics and discovery software market.